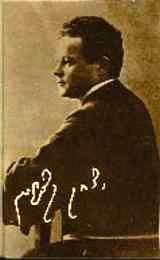 Itzhak Katznelson (1886-1944), a Hebrew and Yiddish poet and dramatist, was born in Russia and received his early education from his father, Hebrew author Jacob Benjamin Katzenelson. He later lived in Lodz, where he opened a secular Hebrew school which he ran until the outbreak of World War II. During this period he visited Eretz Israel several times but did not achieve his dream of making aliya. He spent the early years of the war in the Warsaw Ghetto where he witnessed the methodical annihilation of the Jewish community of Warsaw, including his wife and two of his sons. He was active in a Jewish partisan group. In possession of a Honduran passport, he was transferred to the Vittel Concentration Camp in France, in May, 1943. In April,1944, however, he was deported to Auschwitz, where he and his remaining son perished the following month.